The Quds Force commander has railed against the U.S. presence in the Middle East, saying the American troops' fear is attributable to their "faithlessness", emphasizing that unlike them "we do not fear death at all." General Qassem Soleimani made the remarks while addressing Syrian fighters in al-Bokmal city, in response to death threats against the resistance fighters, ISNA reported on Friday. "Someone who [tries to] scare us is like someone who gives us medals," the commander boasted. "Of course, not being afraid of [losing] our lives does not mean that we have no plans." Pointing to the recent defeat of Daesh (ISIS) in Iraq and Syria, Soleimani said: "These are all God's will and the likes of Americans are nothing against God's will." He also praised the resistance fighters for their sacrifices in the battle against terrorism in the region. On November 21, General Soleimani declared the end of Daesh in a message addressed to Leader of the Islamic Revolution Ayatollah Ali Khamenei. Supported by Iranian military advisors, the Iraqi and Syrian armies as well as popular forces have fought Daesh militants, and in recent months, managed to flush the terrorists out of their last strongholds in both countries. In his announcement, Soleimani, who has been at frontline positions in the fight against Daesh, thanked Ayatollah Khamenei's wise leadership, the sacrifices of Iraqi and Syrian people and governments as well as the defenders of the shrine for their courageous fight against the terrorist group. He also thanked Lebanese resistance movement Hezbollah and Iraq's Popular Mobilization Units, known as Hashd al-Sha'abi, for their "decisive role" in the fight against Daesh. 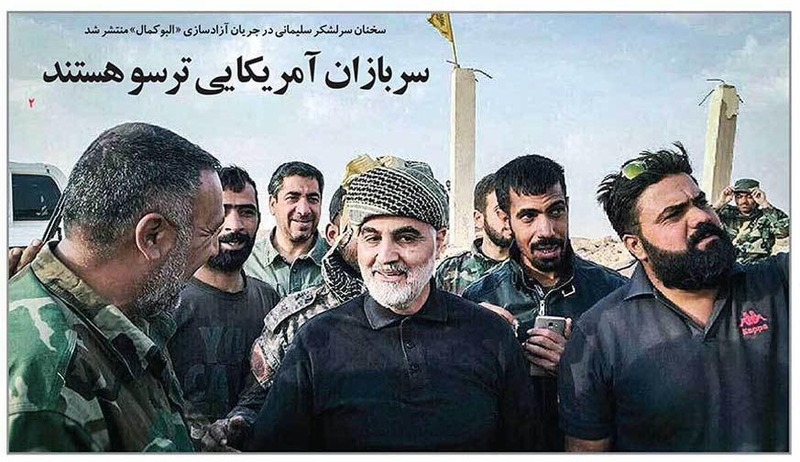 Professor Tim Anderson, a distinguished author and senior lecturer of political economy at the University of Sydney, Australia, told the Tehran Times that General Soleimani played a key role in the victory against Daesh, and that his role "tells us much about the future of the region." "The IRGC Quds Force leader acted not just as a general of the Islamic Republic of Iran, but as a leader of the integrated regional resistance," Prof. Anderson said. He also praised Soleimani's knowledge of the peoples and countries of Iran, Iraq, Syria and Lebanon as an important factor that led to the recapture of the vast territories once held by Daesh. However, he said, "It is in no way to discount the contributions of the Syrian Arab Army, Russian air power, the Lebanese resistance and Iraq's army and popular forces to point out that General Soleimani moved amongst them all, bringing together a command and a moral force that could not be broken." He added, "When, in his humble way, he told Iran's Leader that Daesh had been defeated, he told us all that the Axis of Resistance had been reborn."